Portsmouth manager Kenny Jackett watched his side record a 2-0 win at Shrewsbury. Sunderland have dropped to fourth in League One following Portsmouth's 2-0 victory at Shrewsbury. Goals from Ben Close and Brett Pitman at New Meadow saw Pompey move a point ahead of the Black Cats - ahead of their meeting in the Checkatrade Trophy next weekend. Kenny Jackett's side have played two games more than Sunderland, though, with the Black Cats' next league game coming on Wednesday, April 3 at Accrington Stanley. 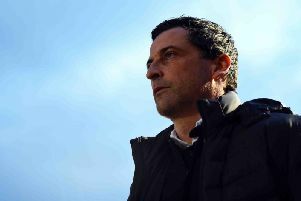 Jack Ross' side also fell further behind the top two sides in League One on a day when Luton and Barnsley both picked up three points. Daniel Stendel's side left it late to claim a dramatic 1-0 win at Walsall in Saturday's early kick-off, with Jacob Brown netting the only goal of the game in stoppage-time. That result saw Barnsley move five points clear of Sunderland, although the Black Cats now have two games in hand. Leaders Luton also extended their unbeaten run, which now stands at 26 league games, following a resounding 4-0 win over Doncaster at Kenilworth Road. The Hatters didn't miss top scorer James Collins, who is away on international duty with the Republic of Ireland, as goals from Pelly Ruddock, Danny Hylton, Kazenga LuaLua and Luke Berry sealed the win. Mick Harford's side remain five points clear of Barnsley in second, having played the same number of games as the Tykes. The result also saw Doncaster drop out of the final play-off spot, following Peterborough's 2-0 win over Southend at London Road. Above them, Charlton remain fifth in League One despite a fixture-free weekend. Like Sunderland, the Addicks saw their game postponed due to international call-ups and will now travel to Wycombe on Tuesday, April 9.